This is a very weird polish, in the bottle it looks black at first. Looking a little closer at the bottle it looks slightly purple. 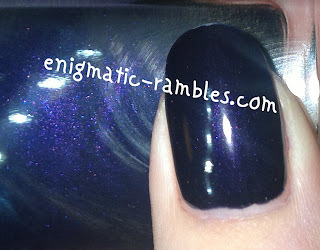 In reality the polish looks very, very deep navy on if not black. This is three coats of the polish and it could have done with another coat. Very thin watery barely pigmented polish. It claims to be a fast drying polish which I have to say I think it is, but generally I don't have problems with polishes taking long to dry. Overall this polish is not a walk in the park to work with.